Give your feet some extra TLC by adding Women's BioSole-Gel Sport Orthotic Insoles to your shoes. BioSole-Gel is an exclusive orthotic by OrthoFeet that contours and forms to the uniqueness of each foot. The Sport orthotic is 3/16 inch thick at the forefoot designed to fit shoes with extra room or shoes with removable footbeds. The insole absorbs shock, offers anatomical arch support and cushions to relieve heel pain. The self-forming arch support is a bladder filled polyurethane memory foam with the BioSole-Gel. It's ideal for active people who like to run, hike and who are generally on their feet for long periods of time such as a nurse or teacher. It's also ideal for individuals with pronated feet, flat feet, plantar fasciitis, suffer from heel pain and heel spurs, have arch pain and much more. The shoe insoles even address lower back pain caused by these foot dysfunctions. Pair them with Biosoft Bamboo Socks offering moisture wicking material. Note: Each full size insole covers a half size larger. The front of the insoles can be easily trimmed to fit shoe and cut down size if needed. 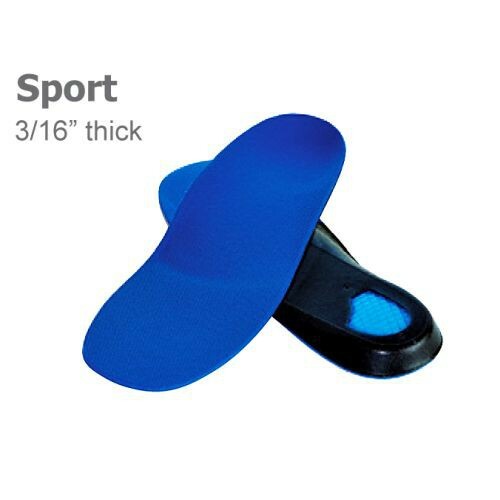 The insoles fit women's sizes 5 to 11 1/2.